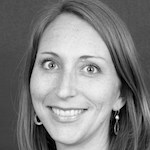 Lauren Braniff is a consultant working with CGAP on the Digital Finance + Initiative. She was managing editor of the Microfinance Gateway from 2011-14 where she led content strategy and created the forthcoming Gateway Academy, an online learning platform for financial inclusion professionals. Prior to joining the Gateway, she spent five years with CGAP’s Technology Program where she conducted research, led branchless banking projects and managed the Information Systems Program. Prior to joining CGAP, she worked at a microfinance institution in Cambodia, as a microenterprise development consultant and as a researcher for an education nonprofit. She earned a master’s degree in international development from SAIS at Johns Hopkins University and a bachelor’s degree in international political economy from the University of California, Berkeley.